(Photo: Church of Scotland)Imam Sayed Razawi, Director-General of the Scottish Ahlul Bayt Society, addresses the Church of Scotland General Assembly on May 25, 2018. A leading Muslim cleric has said the Church of Scotland is a "home" for him as he addressed its annual General Assembly praising the Presbyterian church for fighting Islamophobia during a speech in Edinburgh. 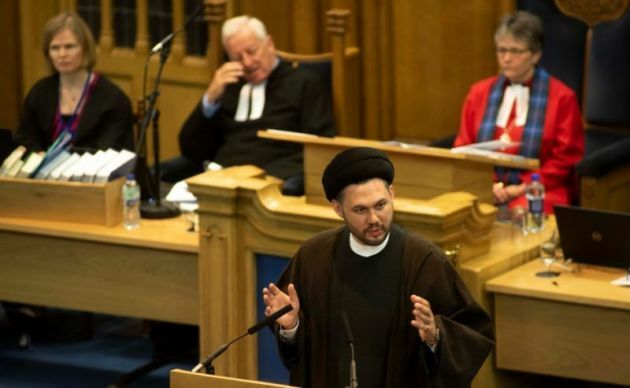 Imam Sayed Razawi, director-general of the Scottish Ahlul Bayt Society, said those who follow Christianity and Islam represent "different shades of the creator". The General Assembly of the Church of Scotland is church's governing body that generally meets each year and is chaired by a moderator who is elected at the start of the Assembly. The Shia imam made the remarks in an address to the General Assembly in Edinburgh on May 25. He said friendships lead to hope and the world needs hope because many people live in a state of confusion. He said that despite living in an age of social media, real dialogue is often lacking. "As I come here today, I feel at home and feel part of a family," he said. "I feel like a brother." Most of Scotland's Muslims are members of families who immigrated in the late 20th century, says Wikipedia. Scotland's Muslims in 2001 represented just 0.9 percent of the population (42,557), with 30,000 in Glasgow. By 2011, the Muslim population had increased to 76,737, accounting for 1.4 percent of Scotland's population. The imam said countries across Europe were witnessing the rise of far right and far left movements. "There is a term I picked up in Sweden known as Liberal Fascism," he noted. "I did not understand what that was but I came to realize that it is intolerance from people who claim to be religious. "In our strive to be equal, what we are doing is polarizing people." Razawi said different types of ideological extremism and fundamentalism was "plaguing our world." Brotherhood is the most powerful position in Islam and that why is it important to extend the hand of friendship, he added. The Muslim cleric told the gathering, "We will be with you in times of difficulty in the same way over the years you have been with us in times of difficulty. "The Church of Scotland, for me, has become a home. "Whenever we have seen the rise of Islamophobia, you have been there to support us and just two days ago I was in Pakistan supporting Christians there. "We are walking with you shoulder to shoulder - the days have gone just to sit opposite. "To hold hands under the shadow of God and walk together with God." The iman told the General Assembly that religious people ultimately "believe in the same reality." "An absolute being is found in all of us, we are the image of God," he said. "We represent different shades of the creator."